RF smart evolution is the innovative radiofrequency that emits treatments both MONOPOLAR and BIPOLAR for face and body. Depending on the desired result and the area to be treated the operator can easily choose the best technology (mono or bipo). RF SMART EVOLUTION is a technology used for its good results and because it has no contraindications and can be used even during the summer. The use of the different modes monopolar or bipolar means a different depth of action, because of this a different use depending on the problem to treat. 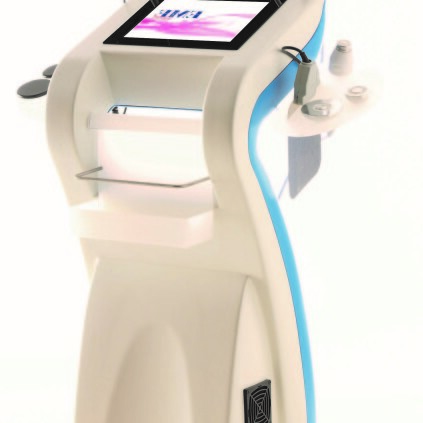 The monopolar radiofrequency is suggested to treat water retenction, cellulite and localized fat. This kind of radiofrequency has one applicator and one return plate to be placed under the shoulder or the thigh, in order to have maximum contact surface. The bipolar radiofrequency, thanks to the two polarities on the same applicator can be used on face, to treat acne scars, wrinkles, psoriasis and teleangiectasia; on small body areas to treat stretch marks. Visible results since first session. RF Smart Evolution radiofrequency stimulates the increase of heat in tissues and produces various benefic effects as the stimulation of local microcirculation and the production of collagen and elastin. MONOPOLAR: it is recommended for aesthetic treatments on body, guarantees good results thank to its deep action. The current goes from the electrode to the return plate. The monopolar radiofrequency penetrates the derma entirely, it runs through the hypodermal fibrous spatae and reaches the superficial muscular fascia. BIPOLAR: it is recommended to get the best results when treating face, neck and décolleté. In the bipolar radiofrequency system each of the two electrodes is placed in the applicator, so the heat action goes less deep and it is concentrated halfway between the positive and the negative electrode. In this way bipolar radiofrequency acts on a more superficial level and does not affect the deep layers of the derma and fibrous septae. suggests step by step the movements of probe to the operator, to obtain a perfect treatment both on face and body of men and women. In monopolar mode be sure that the return plate is completely in contact with the body and with cream. Start the treatment with a low power and then increase it. Make the treatment on clean skin. Do not wear metallic objects during the treatment. Do not use on mammary glands. Make a treatment with Ageless before or after the radiofrequency to increase the benefits of radiofrequency.